It is surprisingly common for patients to seek a second opinion before beginning a prescribed treatment program, particularly when surgery is a possibility. If you have recently received surgical advice from your physician but would like to seek a second opinion, Steven Meier, M.D., a well-respected orthopedic surgeon based in Beverly Hills, can offer a complete evaluation of your case to confirm the need for surgery or to suggest alternative treatment options. Though your initial consultation may have been with a perfectly competent physician, if you are having doubts or have unanswered questions about the recommendations another surgeon gave, it may be helpful to have another set of eyes review your condition, answer questions, and provide insight to possible treatment options in Los Angeles. Even if a second opinion confirms what you already know, it can still offer the peace of mind that you are making the right decision. As a fellowship-trained orthopedic surgeon, Dr. Meier routinely provides second opinions for patients around the country and even internationally. After thoroughly reviewing all pertinent test results and carefully explaining each alternative, Dr. Meier will propose an appropriate treatment plan suited to both your physical condition and personal preferences. His philosophy is that the most effective treatment plans are built through trust and communication between the doctor and the patient. A leading expert in joint preservation and restoration techniques, Dr. Meier is trained in cutting-edge orthopedic surgical procedures that may not be offered by your current physician. A second opinion might reveal a patient’s eligibility for an advanced cartilage restoration procedure of the knee as opposed to merely living with the pain, or considering knee replacement at an early age. Maybe a partial knee replacement would be better suited for an older, active person with a specific form of arthritis, rather than a total knee replacement. Partial knee replacements can be performed in an outpatient setting, while total knee replacements usually require a few days in the hospital. Consulting Dr. Meier regarding your knee or shoulder condition is a great way to determine if you have thoroughly considered all possible options. In addition to his medical expertise, Dr. Meier is a licensed medical evaluator (AME, IME, QME) and is happy to provide an independent evaluation to review cases regarding worker’s compensation or medical-legal discrepancies. As per his certification, he remains a neutral party and will accept requests from both patients and insurance companies in Los Angeles. 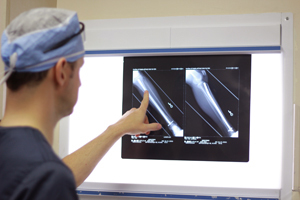 Whether you are a patient of Meier Orthopedic Sports and Regenerative Medicine or a patient of another orthopedic surgeon in Los Angeles, Dr. Meier supports your right to seek a second opinion. To learn more about Dr. Meier’s practice or to schedule a consultation for orthopedic services and sports medicine, please contact us at 310.736.2793.